Flakes are only one type of food for goldfish. Just like the rest of us, goldfish do best with some variety in their diets, and thrive on a varied diet that’s closer to what they would be eating in the wild. You may even find that they’ll swim to the top to take their favorite tidbits from your hand. Goldfish love to munch on live plants. If you have some in the tank or pond with your goldfish, don’t be surprised if the plants start to look pretty bare and need replacing every so often. If you have lots of greenery in with your goldfish the plants may do better, since the goldfish can spread the nibbling around a bit, giving the plants time to recover. You can always add a few plants, such as anacharis, as a special treat that your goldfish can take a few bites out of whenever they’re in the mood. Wild goldfish will eat any kind of bugs they happen upon, as long as they can swallow them. 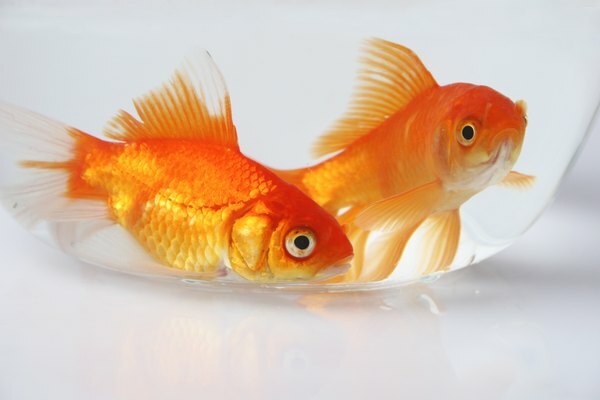 You can offer your goldfish live or frozen foods that are similar to their natural diet. Daphnia, also known as water fleas, are a favorite, as are mosquito larvae, bloodworms and tubifex worms. Brine shrimp are another delicacy that goldfish like, and are easy to raise as well as readily available as a frozen treat. They’ll also eat earthworms, chopped or whole. Though they don’t often find veggies in their natural habitat, goldfish enjoy bits of lettuce, cooked peas, cooked zucchini, Swiss chard and beet tops. Your goldfish will appreciate having vegetables to eat, and they will help keep him healthy by adding necessary fiber to his diet. Clip lettuce and zucchini to the side of the aquarium to make it easy for your fish to grab. Peel and squash peas slightly before you drop them in with your fish. Goldfish can eat a diet of commercial pellets as an alternative to flakes. Pellets come in different types, so take a good look at the label before you buy it. The most common type of goldfish pellet contains all the necessary ingredients for a complete diet, and has essentially the same ingredients as found in flakes, but in a compact pellet form. You can also get pellets that have just a single ingredient, such as dried brine shrimp or daphnia. If you want to use pellets, feed the single-ingredient pellets as a treat and use the combo pellets as the basis of your goldfish’s diet.